ROOTS Reunion takes place during ROOTS Week Annual Meeting and Artists’ Retreat, at Lutheridge Conference Center in Arden, NC – just 15 miles south of Asheville. This page contains helpful information for folks who are ONLY attending the ROOTS Reunion on Friday, August 12 and Saturday August 13. If you are attending the full ROOTS Week (August 10-14), visit this page for ROOTS Week-specific Travel and Logistics info. Green Icon: Look for this icon for green travel tips and other ways you can help make ROOTS Week as sustainable as possible. Also check out “Green at the ROOTS” to learn more about Alternate ROOTS’ green efforts. Due to space limitations at Lutheridge, ROOTS Reunion attendees will stay off campus. We are working with area hotels to provide a ROOTS Rate for individuals who are just attending ROOTS Reunion. Check back on May 1 for a full listing of area hotels and RV parks, and details about group rates. If you would really like to stay on-site at Lutheridge, consider registering for the full ROOTS Week! Includes breakfast, airport shuttle and shuttle to Lutheridge. Hotel will arrange specific times for the shuttle pick-ups and drop offs at Lutheridge. Shuttle is 24 hours. We recommend you arrive no later than 4 PM on Friday. Registration will be open all day, happy hour begins at 4 PM, dinner is served at 5:30 PM, and the evening performances begin at 7:00 PM. 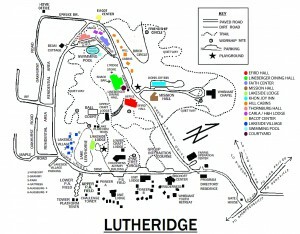 Closer to the event, we’ll let you know where exactly to go when you arrive at Lutheridge. Directions to Lutheridge are below. However, due to limited parking on campus, we ask that you don’t drive to Lutheridge. Instead, we request that you take the shuttle from either your hotel or the designated off-campus lot. See DAILY SHUTTLE TO LUTHERIDGE below for information about getting on and off campus. Please note: GPS devices often lead you to the back entrance of the camp, which is gated (sigh, technology!). Once you follow your GPS to Airport Road, follow the directions below to US-25 and then to the Lutheridge entrance. We’re expecting that up to 200 people will be attending ROOTS Reunion from throughout the South and across the country. Many of these folks will be driving. Because of the environmental and financial cost of fuel, because we like to share, and because road tripping is a great way to meet new people, we encourage attendees to consider carpooling. Abiding by the speed limit. Turning off the ignition if idling for more than 20 seconds. Avoiding major highways in metro areas during rush hour. Speaking of avoiding rush-hour, the scenic route can be faster and safer! Most GPS and online mapping tools include an “Avoid Highways” feature to navigate around major cities and busy highways. Typically, you first have to enter your point of departure and destination; then search for the link to modify your route in a separate side menu or as a footnote to the preliminary directions. If you plan to fly to ROOTS Reunion, Asheville Regional Airport is about 15-30 minutes from Lutheridge and the hotels listed above. If you are staying at the local hotels, you can check with them to see if they provide shuttle service from the airport to the hotel. It may be less expensive to fly into Greenville, SC (1 hour from Arden); Knoxville, TN (1.5 hours); Atlanta, GA (2.5 hours); Charlotte, NC (2.5 hours); Greensboro, NC (3 hours); or Raleigh-Durham (3.5 hours). 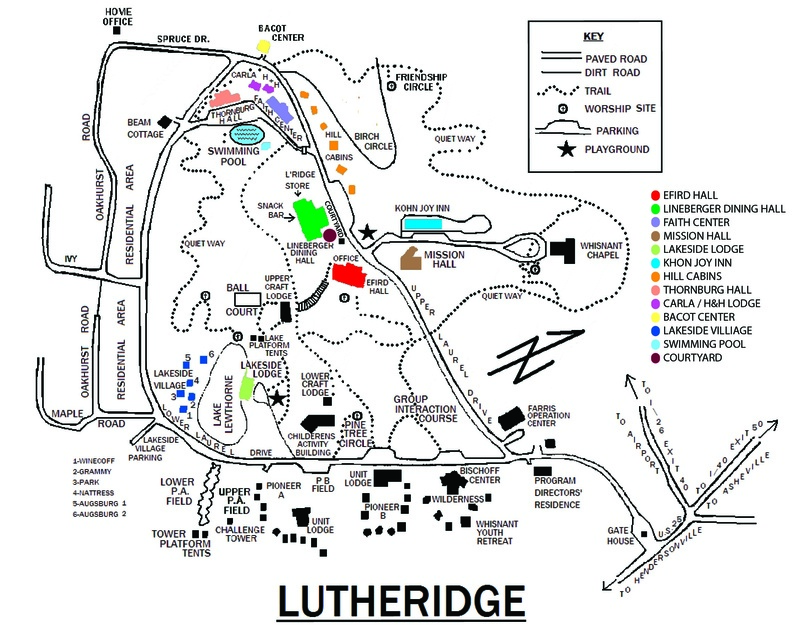 Due to limited parking at Lutheridge we ask that folks staying off campus do not drive to Lutheridge. Instead, you can take the shuttle service which will be provided on an hourly basis between the ROOTS hotels (listed above), a TBA parking lot, and the Lutheridge campus. Check back in early June for more details. Please bring your promotional materials, DVDs, CDs, etc. for our Resource Area. Bring art supplies/costume pieces to create in the moment and musical instruments for jam sessions. Feel free to bring additional tech equipment for site-specific work. And, while all your food will be taken care of while you’re there, don’t forget to bring some extra cash in case you want to get a massage, purchase items from the Arts Market, buy concessions (like espresso drinks! ), or contribute to our 40 for 40 campaign. We strive to make ROOTS Reunion an accessible environment and ask that you notify us of any accommodations you may need when you register. All communal gathering spaces at Lutheridge Conference Center are wheelchair accessible, and all hotels listed above are as well. If you require any type of accommodation – sign-language interpreter, an alternative format for printed materials, etc. – please note this on the registration form and a staff member will follow up with you prior to ROOTS Week. We’ll have limited space in the Youth Village during ROOTS Reunion on Saturday between 9-5 pm, for children ages 5-13. If you will be bringing a young person to the gathering, we will follow-up with you closer to ROOTS Reunion with more details.